A ramen of many colors. In the world of ramen, Los Angeles generally dishes out some of the best in the country. Yet, New York may have produced one of the most famous. 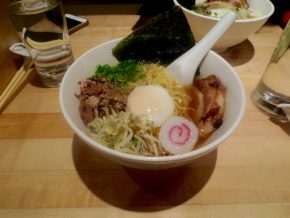 Momofuku Noodle Bar is by no means known for traditional ramen, but its success has spawned other Momofuku offshoots in New York and even internationally. Thus, when I found myself hungry at an off-peak hour I decided I had to take the opportunity to hit up the noodle bar.